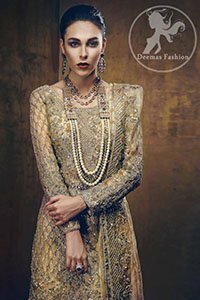 Tags: Bridal Wear, Golden, Lehenga, Walima & Second Day. Shirt contains embroidered jaal all over. Large embroidered border implemented at the bottom. Embroidered border implemented at the bottom of lehenga. Large motifs scattered all over the lehenga. Crystal stones sprayed all over.